Steve McHenry Voice-Overs: L.A. Marzulli To Speak At Upcoming Conference In Cheyenne, Wyoming February 19 & 20, 2010! 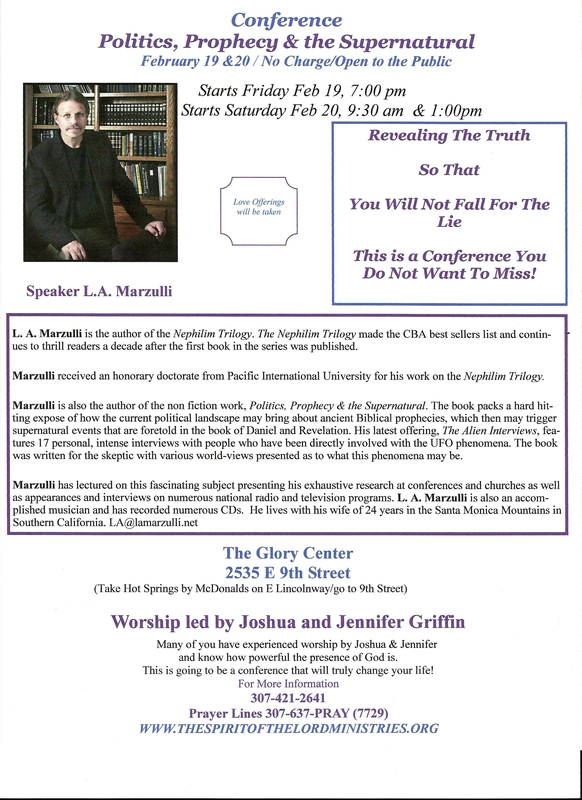 L.A. Marzulli To Speak At Upcoming Conference In Cheyenne, Wyoming February 19 & 20, 2010! The Spirit of the Lord Ministries - FEBRUARY 19 - 20, 2010 CONFERENCE - Speaker L.A MARZULLI - Cheyenne, Wy. I am proud to announce that I will be speaking in Cheyenne Wyoming on February 19th & 20th. The poster above has all the details, so I won’t go into them here. On Friday night I will give a talk about why I believe we are in the last days. This will come directly from the Guidebook to the Supernatural. Saturday morning will be Politics, Prophecy & the Supernatural. This is a two hour Power Point presentation that is based on my book of the same title. This will be followed by a question and answer period. In the afternoon I will present another Power Point talk based on my The Alien Interviews book, followed by a Q&A. I'm excited about the conference and look forward to meeting some of you there. Books, CDs, & DVDs will be available. I believe we are in a crucial time in human history, the last days. The return of the King is eminent, but there is going to be a great falling away, a great deception. These presentations will discuss, at length the coming great deception, the Luciferian endgame, the burgeoning UFO phenomena, as well as the “Alien Gospel.” Hope to see you there!